Initially, we were skeptical that it could survive for long, thinking that it was another of those holiday season plants that were artificially boosted to bloom profusely just for quick sales. But it proved us wrong and was adamant to strive till this very day. Well, it was almost dormant for a little over a year until we decided to repot and relocate it in April. Since being relocated from our shady courtyard to a sunny spot at our front yard garden, our Rhododendron simsii has grown more beautiful than ever. Flower color is more vibrant and even tends toward a brilliant shade of reddish-pink as seen in the left photo, and is now quite a frequent bloomer, flowering continuously for about a month at a time. Simply marvelous! A pity though that we have not been able to identity this beautiful hybrid or cultivar with large brightly-colored double blooms, 4.5- to 7-cm in diameter. A slow-grower reaching 35cm tall in 1.6 years with an upright and outward branching habit that is just perfect for container gardening, indoors or outdoors. Here is sharing a recent image of our R. simsii which was captured about a month ago, looking healthy and happy. Its tallest stem with spent flowers had been trimmed a few weeks before this shot, and used to propagate a new plant. 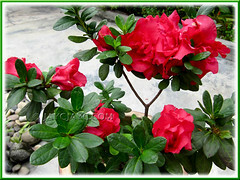 Common Name: Indoor/Indian Azalea, Chinese Indica/Azalea, Chinese Honeysuckle, Sim’s Azalea, Belgian/Southern Indian or Indica Hybrids. 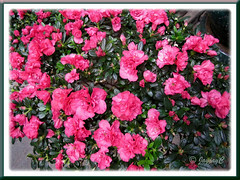 Plant type: Perennial flowering shrub, native to temperate Asia, namely China, Japan, Taiwan, Hong Kong, and tropical Asia such as Laos, Myanmar and Thailand. But now commonly cultivated as ornamental shrub worldwide. 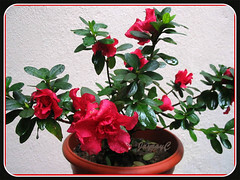 Features: Rhododendron simsii or Azalea indica belongs to the genus Rhododendron that has more than one thousand species and many more hybrids and varieties by the thousands. An evergreen flowering shrub or small tree of the subgenus Tsutsusi which is classified as evergreen azaleas, differing from deciduous azaleas in the subgenus Pentanthera. This highly versatile R. simsii species too has innumerable hybrids or cultivars and varieties with growth rate ranging from slow-growing, moderate to vigorous. Height vary from 30-60cm for the dwarf hybrids and can reach up to 182cm or much higher for some others. Generally, the majority of these perennial shrubs have upright growth habit, much-branched with an outward spreading form and can be straggly at times, though some varieties are dense and compact. Small-leaved foliage is leathery, slightly pubescent on the upper surface and clothed in glossy dark green. Their leaves are simple and entire in variable leaf length (from 2- to 6-cm). Shape of leaves vary too, from ovate-lanceolate to elliptical and slightly oblanceolate, and are arranged alternately along the stems, yet seemingly whorled at terminals. Azalea indica are profuse bloomers of broadly funnel-shaped flowers if provided the correct care, with a long flowering period that last about a month at a time. Flower buds are set even when plants are very small, and a terminal inflorescence can produce 1-6 flowers per bud. Their large showy trusses are long-lasting, varying in colors of white or various shades of red, pink, salmon and purple. Flowers can be single-colored or bi-colored, with or without spots and streaks, and having petals of diverse shapes with flat, recurved or ruffled edges. Depending on the varieties, flower size ranges between 5-7.6cm wide, and are differently formed and typed as single, double and hose-in-hose. They have shallow root system with fibrous roots forming a compact root ball. As such, plants can be easily repotted or replanted. 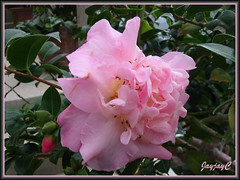 Be informed of Rhododendron toxicity to humans, animals and birds. Culture (Care): An easy-to-grow plant that needs minimal attention. 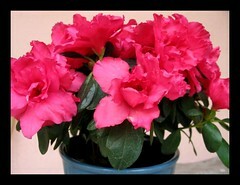 With correct care, adequate watering and regular feeding, Azalea indica will happily bloom for many successive years. Light: Bright and cool conditions indoors. Outdoors, preferably filtered or part sun to semi-shade. Best growth in bright indirect sunlight and in cool conditions, especially during the flowering period. Avoid direct sunshine or high temperatures with dry air to maintain the longevity of blooms, as well as to prevent leaves and flower buds from dropping prematurely. Moisture: Moderate water regularly, preferably with rainwater or soft water if possible. Keep soil moist at all times but not soggy. It loves high humidity, so mist the leaves frequently or stand the pot on a tray of pebbles with water almost to the base of pot. Soil: Prefers a sandy loam medium that is humus or organic-enriched and can retain moisture, yet drains well and is well aerated. It grows best in lime-free acidic soil with a pH of 4.5-5.5. You can acidify the soil with a mixture of 1 tablespoon of vinegar to a gallon of water. Others: Feed once every fortnightly with a liquid fertilizer, especially formulated for acid-loving plants. Remove faded and dead flowers regularly, which can be easily done by dislodging them with your fingers. After flowering, larger shrubs need to be pruned and straggly stems shortened to maintain shape and encourage new growth. Pinch new growth regularly to increase branching, as more branches means more blooms. Yellowing of leaves are caused by lime in the soil, so water plant with soft water, rainwater or add a half-strength acidifying fertilizer at each watering. Brown leaf tips/margins resulting in shriveling indicates underwatering, dry air, excessive heat or too much sunshine. Remove weeds as it dislikes other plants growing over or into its shallow root system. Mulch if necessary to keep roots cool and moist, as well as discourage weeds. Repot root-bound plants when necessary into a container one-size larger. Before repotting, if you observe roots encircling the root ball, make 3-4 one-cm deep vertical cuts around it with a sharp knife. This will allow water to penetrate into the root ball and encouraged new roots to spread out into the soil. Watch out for mealy bugs and mites that can attack azaleas. For subtropical and temperate regions: Hardiness: USDA Zone 8-11 Check more comprehensive culture info on azaleas at HGIC @ Clemson University. Propagation: By seed, layering and tissue culture, but the more popular method is by cuttings from semi-hardwood stem or healthy young shoots. For cuttings, trim 8- to 10-cm long stem cuttings or shoot tips with a sharp knife just below the leaf joint and remove basal leaves. Then, plant them individually 2.54cm deep into moist potting mixture, firm the soil around the stems, site at a warm and bright position and with regular watering, roots and new growth should emerge. Usage: R. simsii or Indian indica with its profusion of spectacular blooms will make an impressive ornamental shrub to brighten any garden. Well-suited for sunny areas or planted under the filtered shade of larger trees, in garden beds and borders or used as hedges and screening. 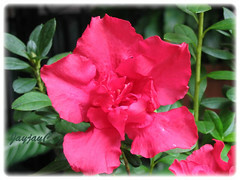 Ideal as an eye-catchy landscape plant in shrubbery plantings or mass planted with a group of azaleas of pleasing colors. It can be trained as an attractive standard specimen and even as a bonsai. The shorter cultivars and varieties make excellent container plants for the patio, deck, porch or indoors. 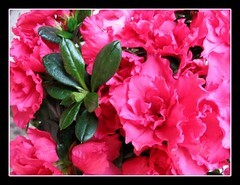 Grow Azaleas to attract butterflies and hummingbirds. 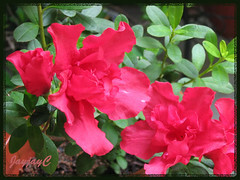 Being long-lasting, its blooms can be used as cut flowers too. 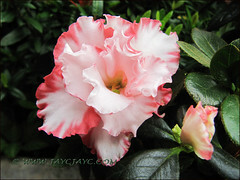 – American Rhododendron Society, on the fundmentals of Rhododendron and Azalea culture, and here for images of hybrids and species. 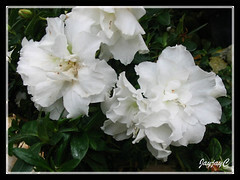 – Azalea Society of America, with such extensive information on azaleas, and enjoy their photo galleries of the innumerous hybrids/varieties found worldwide. – North Carolina Coop. 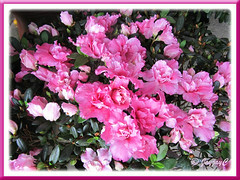 Extension Service, to familiarize with the popular groups of Azaleas. 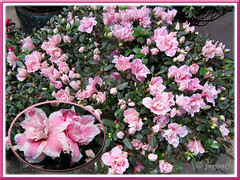 – Henning’s Rhododendorn & Azalea Pages, almost everything you need to know about these spectacular shrubs. 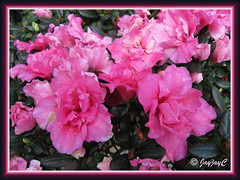 Our potted azalea is still flourishing well and blooming its head off as seen in the right image, shot January 11 2011. 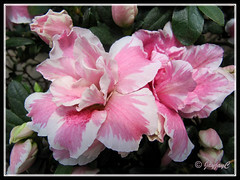 Check here for more of our azalea pictures! Can you tell me if a red ruffled azaela tree can be planted in a pot? If so, what size container should I plant it in?